« Dippers – at risk? Setting out at what seemed an ungodly hour of the morning, after the clocks went forward for Spring, just as the dawn broke and the biting wind took effect on platform 3, you’d be forgiven for thinking it was mid-December already. Aside from the odd song from a timid and I’ll daresay cold Willow Warbler, followed by a few hardy Chiffchaff songs, it felt very much like any other winter morning. After a few minutes and a welcome cup of coffee from my flask, I started to notice more things that reminded me of Spring. 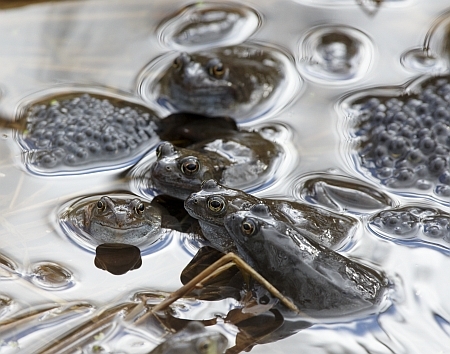 A small patch of quiet water at the back of the reed beds held what seemed to be dozens of frogs and lots and lots of frogspawn. The water was alive with them and they all gathered together, as if to be discussing something. 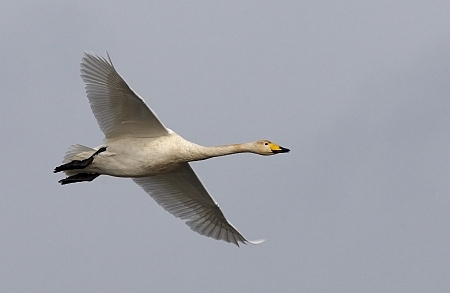 A Whooper Swan, who had over-wintered here suddenly took off, gave us a flypast and departed north, only to settle back down – maybe he’ll be off in the next day or so. 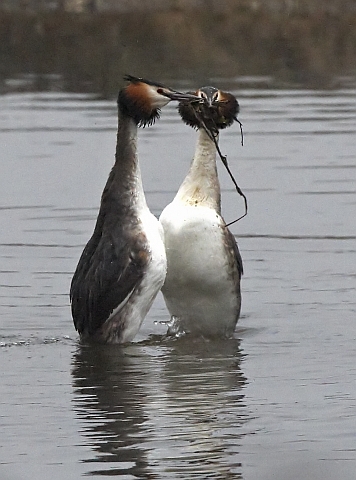 Over the reedbed, in the loose morning light, a pair of Great Crested Grebes performed their beautiful weed dance. All around me spring was showing herself – all I had to do was to keep looking and listening. Suddenly out of the corner of my eye and far away on the other side of the lake, a cruel part of nature was unfolding. A fox, a regular visitor in a morning, was patrolling along the bank. He spotted a pair of Mallard ducks, more interested in each other, than their safety. 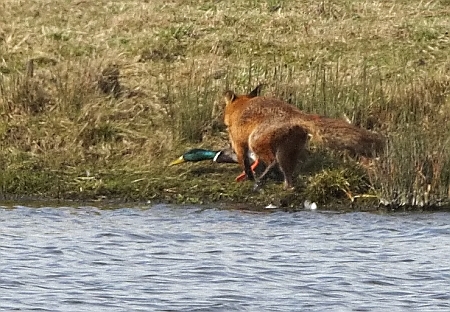 As the fox got closer, he lowered his body to a crouch. Still the ducks were unaware of their fate. He got closer, maybe to within 20 feet, then with incredible speed, he launched at the drake Mallard. 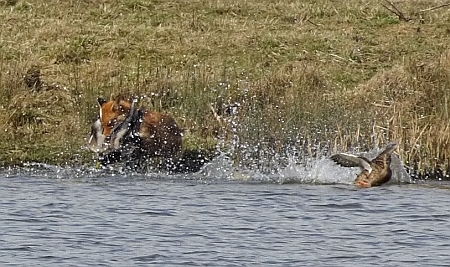 There was a tussle and splash of water – he seized the Mallard and wrestled it from the water’s edge! 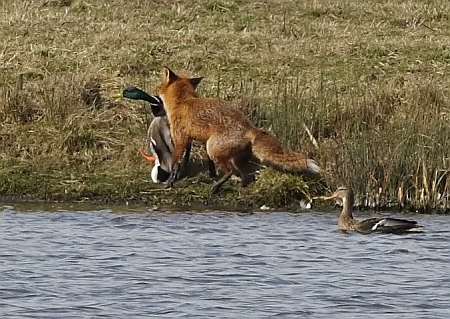 Before he knew it, the Mallard was tightly in the fox’s grasp. These sights are of course rare to see, but they happen nonetheless – it’s all part of nature. The Fox has to feed of course. I had always thought that birds were safe from foxes, on islands or near water, but this one did not seem to mind getting wet. It had been a harsh winter though. Closer in, two Pied Wagtails dropped in, but one seemed lighter than the other. 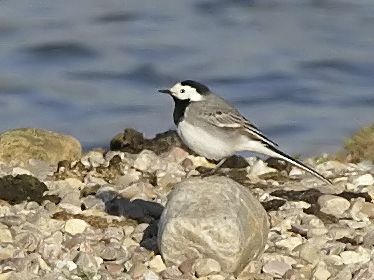 Yes, there it was, my first White Wagtail of the year! You see, even if there is no obvious chance of getting those “keeper” images, it always pays to keep looking and listening – nature plays its tune all around you. A spot of birdwatching kept the camera quiet this morning, but kept the binoculars and the ears busy. Everywhere spring was showing, despite the cold wind – 5 Sand Martins flew north, a Swallow drifted by, a Merlin shot past in the distance and the Shelduck grunted and groaned in the distance, forever arguing with each other. 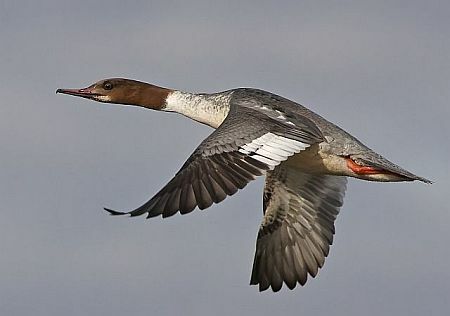 And to top it all, just as I was starting to pack my camera away for the morning, out of the blue shot a female Goosander, towards me at speed. With very little time to compose myself I framed it, adjusted the EV, let the shutter go and hoped for the best. You see, you can have it all sometimes! This entry was posted in 2010, Derbyshire, Willington GP, Year and tagged bed, chiffchaff, cold, fox, frog, goosander, great crested grebe, mallard, reed, shelduck, spawn, spring, wagtail, warbler, water, weed dance, white, whooper, willow, windy, winter.